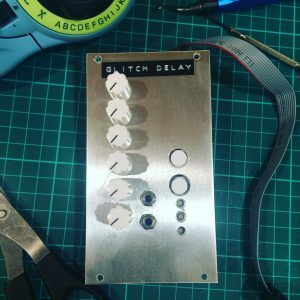 The Glitch Delay is the Teensy based eurorack Delay module I designed that you can read more about here. 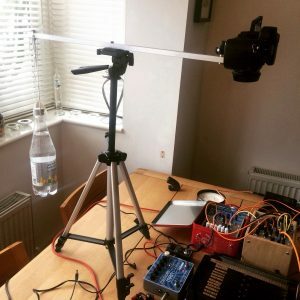 The video shows what it sounds like, but I thought I’d go into some more detail about how it actually works, and how I went about designing it. The brain of the module is the Teensy 3.6. The code running on the Teensy uses the Teensy audio library, and implements a new AudioStream. 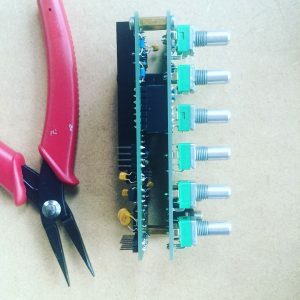 Because the in-built ADC of the Teensy is used by the audio library, we need another way to read the potentiometers, this duty is performed by the PIC. The PIC reads the pots and communicates the values to the Teensy via I2C (a well supported and fairly simple protocol for inter chip communication). Op-amps are used on both the input and the output to scale voltages up and down. You can find the complete schematic here, but I’ll go into detail on the major sections below. 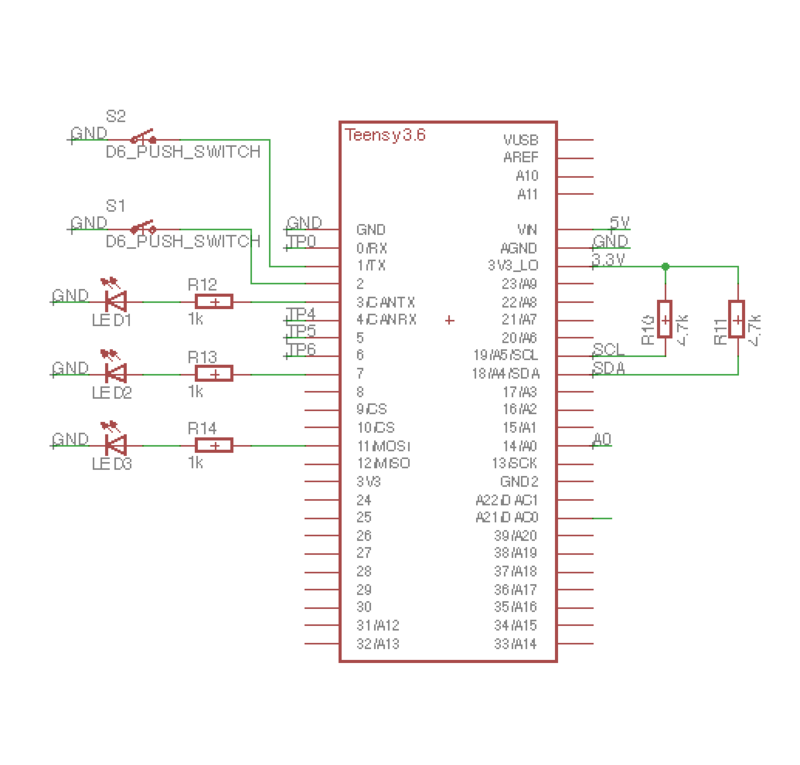 Many elements of this schematic are cribbed/stolen from other open source schematics. 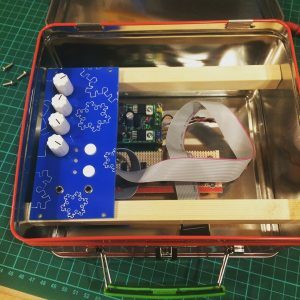 I’d highly advise checking out the circuits behind the Music Thing and Mutable Instruments modules whose schematics are all up on GitHub. I’m a relative beginner when it comes to electronics, so it’s highly likely there are elements of this schematic that are not best practice or wrong in some way, feel free to email me with feedback and corrections! The purpose of this section of the circuit it to scale the modular audio signal from (-5V to 5V), into (0 to 1.2V). 1.2V is the voltage of the internal reference in the Teensy. 5V is added to the incoming signal to bias it to be 0V and above. This circuit is an op-amp summing amplifier similar to this. On the way out we want to do the exact opposite. 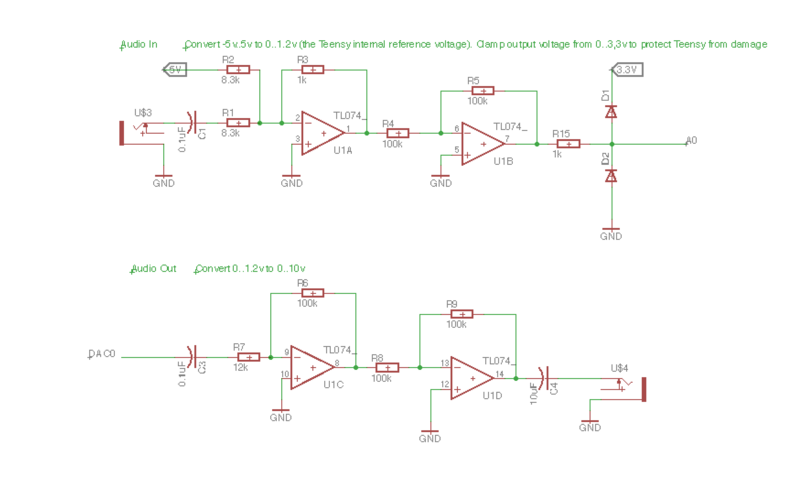 Scale from (0 to 1.2V) to (-5V to 5V) this is achieved using a simple inverting op-amp. As you can see, this inverts our signal, so the signal is passed through another inverting op-amp with gain 1. The output of this chain will be (0V to 10V) (actually 9.6V, because we are limited by available resistor values). There’s no need to bias, the output capacitor AC couples the output, blocking direct current. Meaning the output signal is centred around 0V, and therefore (-5V to 5V) again. I found the power line to be quite noisy. I tried using an external voltage reference, instead of the 5V power from the regulator but didn’t notice much improvement. Everything is fine if the gain-staging is sound. However, with very low input volumes/voltages you will hear noise when you amplify the output. In future I would add a trimpot or panel pot to adjust incoming voltage (e.g. R1). The Teensy’s main duty is to do the audio DSP. 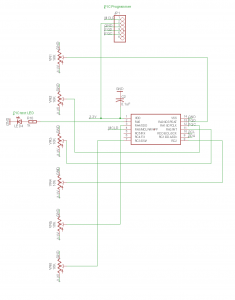 It is connected to the PIC chip via I2C. This uses the SCL and SDA pins on the Teensy (with pull-up resistors to the power line). See here for more information. On the Teensy this is supported through the Arduino Wire interface, and is very straightforward. I shall go into more details on the software running on the Teensy in future posts. The Teensy also controls the LEDs and reads the push switches. There are lots of pins on the Teensy, so it seemed best to connect them here. It could have been done with the PIC, but there aren’t enough pins so you’d need to use a multiplexer. The PIC chip is connected to all the potentiometers. It reads their values and passes the data to the Teensy via I2C. I’ve connected the programming pins to header so it can be programmed on the board. There’s also a connection for an LED for debugging purposes. Neither of these are strictly necessary, but are very useful at the prototyping stage. The capacitor to ground on the power line is as per the data sheet, presumably to deal with minor fluctuations in voltage. All of this was designed in the free version of Eagle. A very powerful, but rather infuriating piece of software (the UI leaves something to be desired, although is getting better). 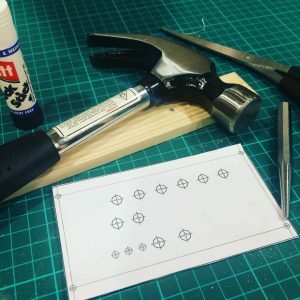 After you’ve designed the schematic you have to layout the board. This is a fun and at times tricky puzzle game. You need to route all of your connections without crossing over another track on that layer. 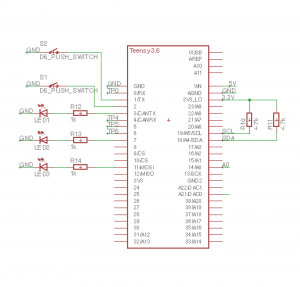 You can use vias to change to another layer of the board which makes things easier. It’s definitely worth spending some time experimenting to get a layout you are pleased with. You’ll end up with something that looks like this. 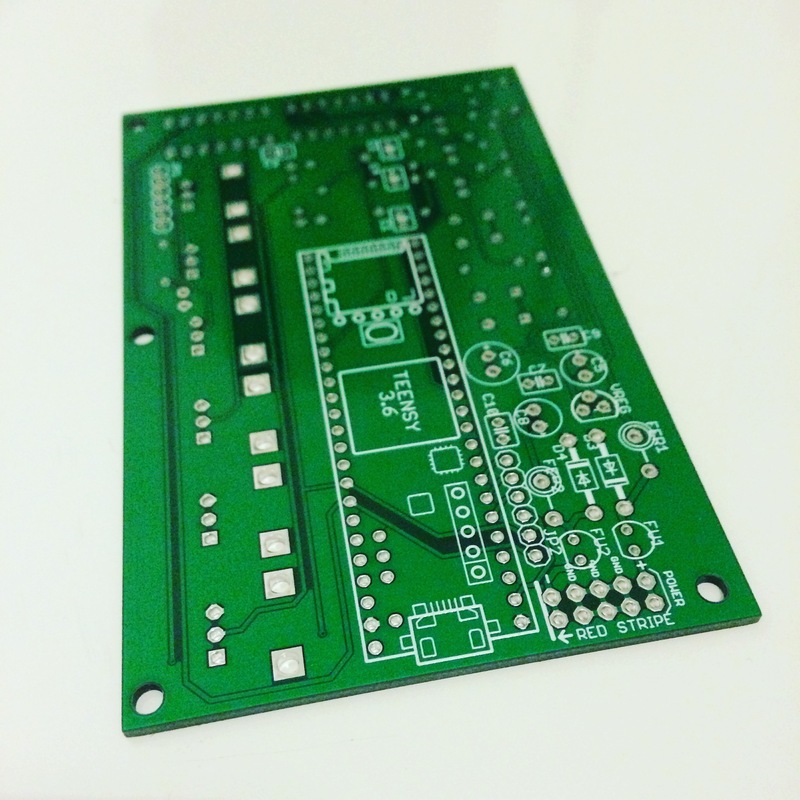 You can then send it to a PCB fabrication house to get it made. I used Hackvana, who I was very pleased with. 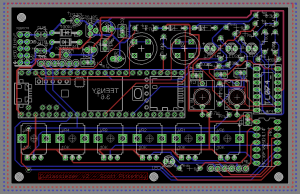 There are a number of alterations I would make on a future board, a major one being that the power connector is too close to the Teensy, meaning I have to improvise a little on the connections. 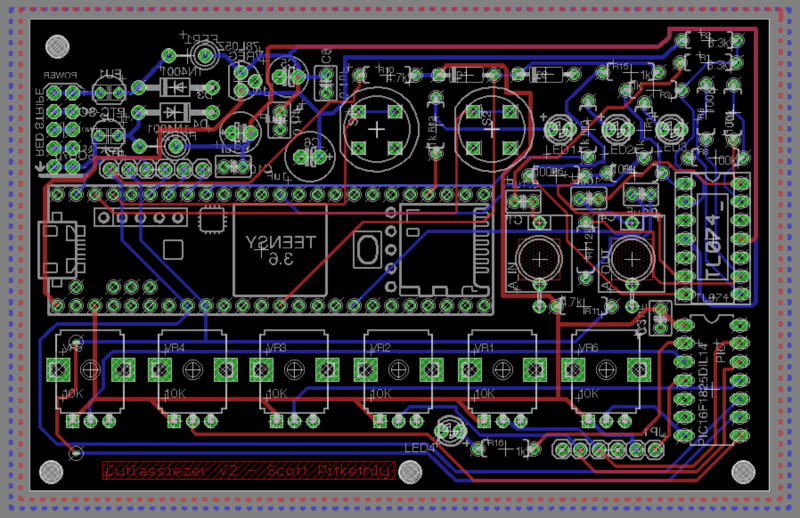 That said, it did work first time, which isn’t bad for a board of this complexity. In further posts I shall go into a bit more detail about how the software works, and further developments. Happy New Year everyone! I hope your holiday period was less mired by illness than mine. One of the benefits of not feeling up to leaving the house was that I had time to make a demo video for my Glitch Delay Eurorack module. The effect is designed around the Teensy 3.6 dev board. 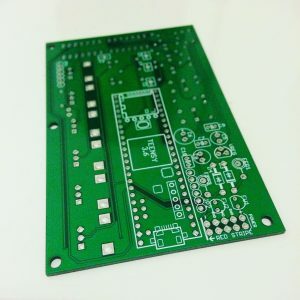 I designed the PCB in Eagle and had a small batch manufactured. This is very cheap to do nowadays, only a couple of pounds per board. 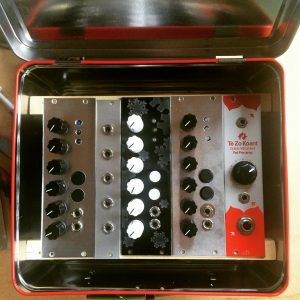 The effect consists of a standard delay line, or delay buffer, with multiple read heads that each read the audio in a different way. There is a feedback path, so the effected signal can be feedback into its self. 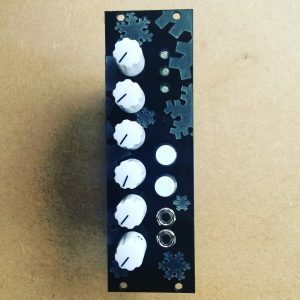 Reverse head – This head plays the buffer in reverse at the original octave. The top white button allows you to set a tap tempo. This forces the looping heads to jump to a new position on every beat. The bottom white button is the ‘freeze’. This freezes the write head. No new audio will be written into the buffer, the old audio will remain. This essentially ‘locks-down’ the audio, so it can be tweaked without the buffer changing. I shall post soon with more details of how to go about creating your own. Can I use this in software? Yes! 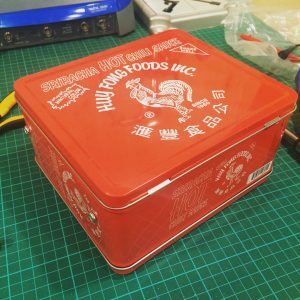 I’ve ported the code to the JUCE framework. You can compile it yourself or download the executables from the GitHub here. There are still some issues to resolve. The output can be a little noisy. 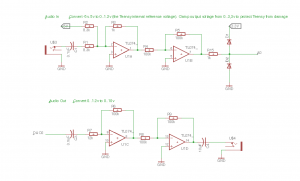 This noise comes from the 5v offset applied to the incoming audio. This is mainly a gain-staging issue, and could be resolved by having an additional potentiometer to scale the amount of bias applied to the incoming signal. There is another issue where the module occasionally fails to power up. I believe this is due to occasions where the 12v line takes a little time to stabilise, which results in the 5v regulator supplying the Teensy with a voltage of less than 5v for a short period, which causes the Teensy to crash. I have a workaround for this in mind though. 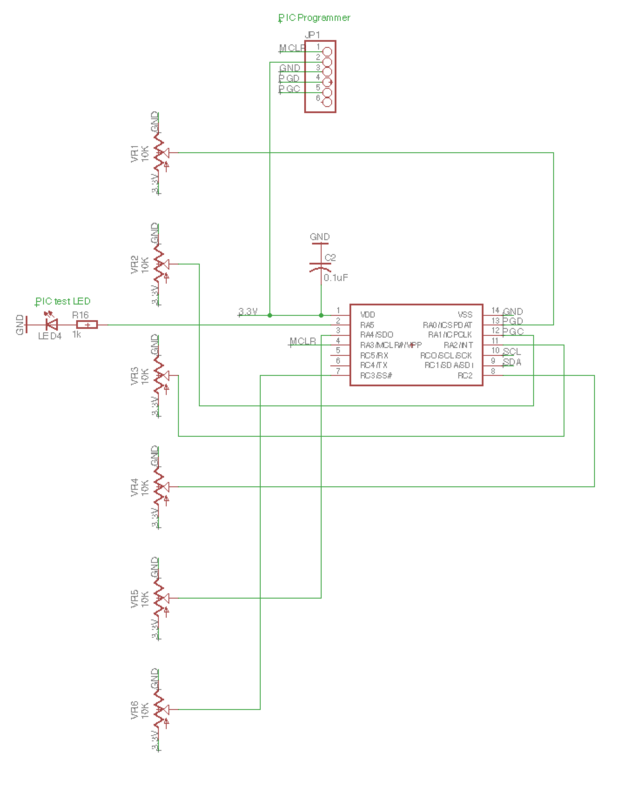 I plan to build an expander module which will connect via I2C which will add CV control of many of the parameters. Check back for updates..
I’ve spent quite a lot of this year (when I wasn’t working on the album) designing a new Eurorack module. It’s inspired by some of the demos I watched of Lines running on the Aleph (by Monome). I’ll be putting up more details soon, but it’s a glitchy digital delay/granular effect running on a Teensy 3.6. I plan to put together a video soon! 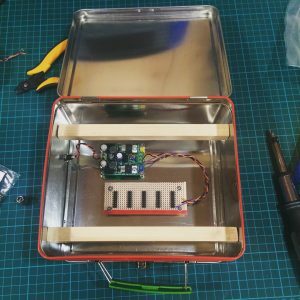 This weekend I built a DIY Euroack case out of a cheap tin lunchbox from eBay. I want this case to house some of my Teensy based modules and form an all-in-one guitar focused effects box. The project was reasonably straightforward. I used one of these power boards which supplies +12v/-12V from a 14-24V DC power supply. The board that the ribbon cables connect to is vero board with single header, doubled up. Everything was mounted using 11mm M3 brass stand-offs. The wooden rails are possibly a little thick and will limit the size of the PCB under the module panel. Will have to see how that goes. Putting in thinner rails should be feasible. All holes drilled with my new pillar drill. Much easier, with far less swearing than trying to use a standard power drill. The overall project build cost was around£20. 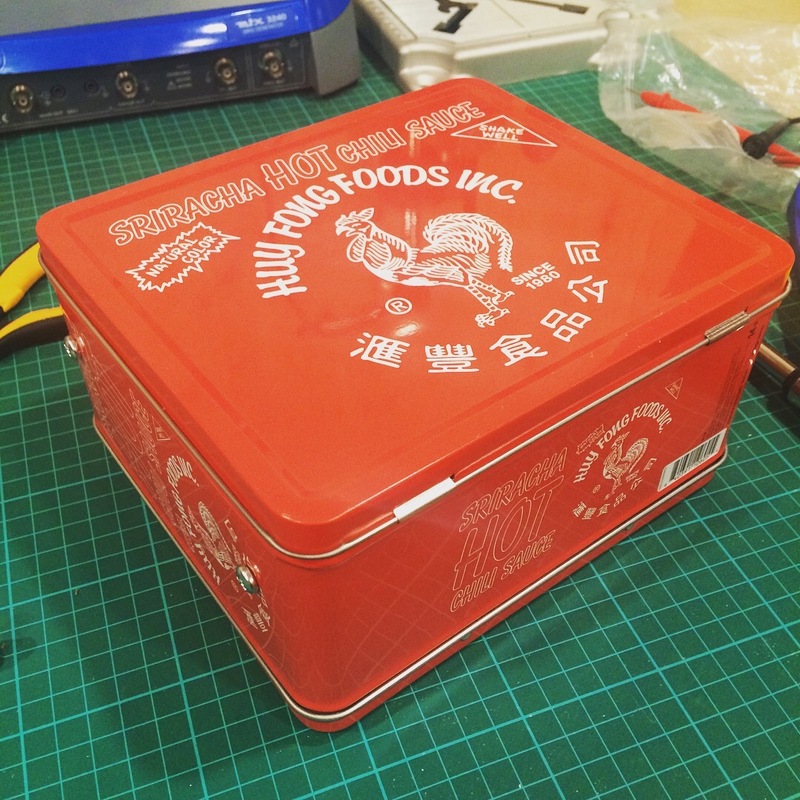 Looking forward to filling this with my DIY modules!